This apple pie coffee cake is a delicious addition to a Christmas brunch or evening get together. 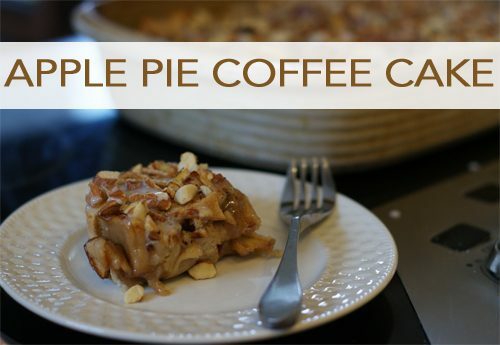 Served with a hot cup of coffee, it’s tasty and filling and easy to make ahead of time since it’s served at room temperature! While it’s not the healthiest treat since it’s more dessert than breakfast, I think it’d be a sweet addition to your Christmas morning breakfast table as well. Preheat oven to 350 degrees. Grease and flour a 9×13″ pan. Prepare apple slices and sprinkle with lemon juice. In a small bowl, combine brown sugar, flour and cinnamon. Combine apples and sugar mixture until the apples are evenly coated. Set aside. In a mixing bowl, combine flour, sugar, salt, baking powder, cinnamon, sour cream, eggs and water and beat until well blended. Pour into prepared pan. Top with spoonfuls of apple filling. While the cake is cooling, mix powdered sugar and milk. Use a spoon to drizzle it over the cake.